Grease 9x13 baking dish. In medium skillet, brown sausage; drain. 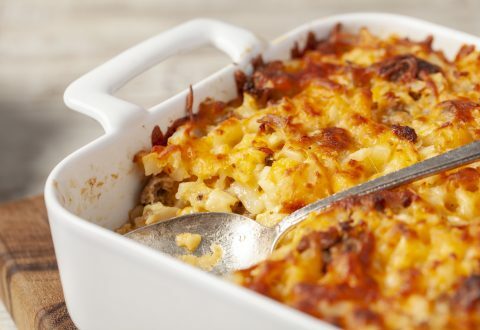 In large bowl, combine sausage, hash browns, onion, milk, 3 cups of the cheese, salt and eggs. Pour mixture into greased baking dish. Top with remaining 1 cup cheese. Refrigerate, covered, several hours or overnight. Heat oven to 350 F. Bake, uncovered, until knife inserted near center comes out clean (50-55 minutes). Let stand 10 minutes, covered. Cut into squares and serve warm with salsa.